Submitted by novicebaker31 on March 3, 2015 – 7:14am. Hi Everyone! This is the first time I am posting, but I’ve been reading the forums and articles on this site for a while now. I’ve got a beautiful starter going, and my sourdough has been coming out better and better with each try. There were a bunch of times I wanted to throw my hands up and say forget it, but reading all of your posts motivated me to keep trying! I still have so much to learn, and I’m glad I have this site to guide me along. So THANK YOU to all of you! 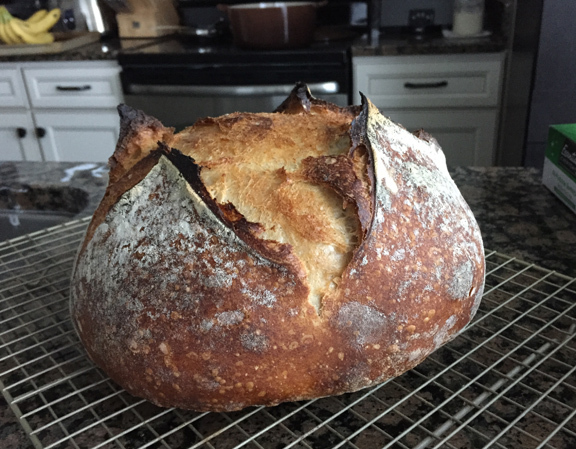 Here is my latest sourdough loaf- Just took it out of the oven about an hour ago. Any feedback/pointers are welcome!